The latest news from around the greens in the Harrogate District. Catch up with all the latest news from around our Harrogate and District golf clubs. The first alliance of the season was played at Pannal GC on Wednesday September 26. Sixty pairs played in this four ball better ball competition on a warm autumn day. The top score from the first six pairs was 39 points by Bob Fawbert and Archie Hughes (Rudding Park), with a hole -in-one recorded on the card. Congratulations to Archie on his ace on the third. S Richardson and G Whittington (Oakdale) playing in the next fourball in returning a score of 41 pts went to the top. They in turn were replaced by Sturdy and Williams (Rudding Park) on 43. The top spot again changed hands when the next pair A Norfolk and P Newton (Ilkley) carded 45 to claim the victory. Williams (Rudding) 43, 5 J Bradley and D Lund (Knaresbrough) 42 b9, and 6 L Shaw and P Tomkinson (Otley) 42 b6. In a finale to the summer events the Union Match Play Championships took place at Ripon City GC on Sunday. In the men’s final James Gaskell (Ripon), the defending champion, played Dan White (Pannal). White was four up after 12, then Gaskell won the 13th and the pair halved the 14th. At the 15th White’s approach shot was short, while Gaskell was on the green with a 15-foot putt for the hole. It wasn’t to be; White holed the chip and won the match 4 & 3 to become champion. This capped a fine year for White who will also be crowned as Union Golfer of the Year. During the year players are awarded points for winning games when representing their club or the union in inter league/union matches. Points can also be gained from ones performance in the stroke play, match play and First Division Team championships. The ladies final between Tracey Batty (Otley) and Joanne McBratney (Knaresbrough) was a very close competition with Tracey one up after three holes. The next three holes were halved. Tracey won the seventh and holes eight and nine halved. On the 10th, both drives went into a group of trees on the right of the fairway. Unfortunately Joanne’s second shot hit a tree and rebounded backwards. Her third shot went into the trees to the right of the green and her chip was short. With Tracey on the green for three Joanne conceded the hole. The match was dormie – 4 after the 14th. Tracey won the 15th and the match 4 &3 to become champion. Saturday’s Open Stableford competition was played in fine conditions, but with a blustery wind which increased in strength as the day progressed. It resulted in scoring being a little more modest than usual, exemplified by there being only six twos so a good dividend for the twos club this week. In Division One, Nick Louden’s 37 points was the only score better than par, earning him first place and a handicap reduction to eight. Three players came in with 36 points, and on the tightest of countbacks Jon Mountford (2) was awarded second place ahead of Chris Blantern (5) in third, just edging Craig Hunter (4) off the podium. Division Two saw the best scoring, with seven players beating par. John Ellacott’s 40 points was all the more impressive considering his triple-bogey on the first hole, and he was awarded first place on countback as well as a handicap reduction to 11. Tim Matthews (11) also reduced his handicap by one shot after his 40 points in second place. Philip O’Connor (11) came third with 38 points, just edging Philip Cave (12) and Moira Rusling (13) off the podium on countback. There were also handicap reductions for the top placings in Division Three, where Chris Matthewman (16) had an excellent back nine in his 38 points for first place, ahead of J C Lister (21) on countback in second, and Men’s Captain Mike Starkings (21) third with 37 points. On Thursday Pannal held its first ever Par Three Competition, whereby every hole on the course was turned into a par three – some with very unusual pin positions. Sixteen teams of four played the adjusted course from a shotgun start, with all those that were “nearest the pin” on each hole qualifying for a shoot-out watched by an enthusiastic crowd on the balcony. The team prize was won by the all-ladies team comprising Rebecca Booth, Amanda Dunn, Rebecca Ellacott and Jo Fawcett and the-shoot out was won by Peter Clarkson. The occasion was also noteworthy for the fact that two of the “nearest the pins” were holes in one for Joy Bowler on the 13th and Colin Greenwood on the seventh. It’s a shame that their aces came so early in the round, as there was a special prize up for grabs for anyone scoring a hole in one on the 17th – a trip to the 2019 Masters. Unfortunately, no-one managed this feat, though Simon Stalker came agonisingly close. Tuesday’s Ladies’ Stableford was also played in conjunction with Macmillan Spoon, with all the competition entry fee going to Macmillan Cancer Support. Scoring was very tough with CSS increasing to 78. Silver Division was won by Gail Witcomb (16) with 34 points, 2 points ahead of Anne Padgett (14) in second place. Ruth Skaife-Clarke (3) came third on countback from Sandra Taylor (9) with 31 points. Bronze Division was won in convincing fashion by Joanne McCormack (37) with a superb 39 points, easily the best score of the day, and 10 points ahead of her nearest challenger Sally Ragan (29) who came second. Deborah Waind (33) was third on countback with 28 points, ahead of Anne Chippindale (25). Congratulations to Joanne McCormack who won the Macmillan Spoon and also reduced her handicap by four shots. The nine-hole green course stableford competition was won by Amanda Finney (36) with 15 points, one point ahead of Elaine Pawley (35) in second place, and Margaret Kershaw (29) a further point back in third. Tuesday’s golf was also complemented by a coffee morning/afternoon which Ladies’ Captain Julie Smith had organised to raise funds for Macmillan Cancer Support. As well as a raffle and tombola, there was a “Beat Pete” putting competition won by Ruth Skaife-Clarke. Overall, the event raised over £800 for Macmillan Cancer Support. Certainly, cooler conditions did not dampen the enthusiasm of the ladies who gathered for their Stableford competition on 25th September. The nine-hole event was won by Linda Thornber, whose 21 points were five ahead of Beryl Geldart in second with with Sue Herridge’s 15 securing third spot. The 18-hole competition saw Julia Samways winning Division One with 35 points on countback from Sandra Castle. Kathy Page secured third with a solid 31 points. Jean Woodcock shot the best round of the day to lead Division Two with 36 points, two shots ahead of Barbara Skinner in second place. Kathleen Henderson finished third with 32 points. The Division Three winner was Liz Sturdy, taking it on countback from Kechil Gilchrist with 34 points. Jane Hopkins had 29 points to secure third place. A men’s midweek medal the following day was notable for the fine 70 shot by John Herridge (7) to take the honours in Division One while Past Captain David Ball (15) secured the win in Division 2 with a nett 78. In Division Three, Doug Old (17) was the clear winner with a solid round of 74. Second spot was determined by countback with both Mike Heaps (16) and Paul Herridge (17) shooting rounds of 77. Mike secured second with Paul completing a good week for the Herridges in third spot. The 2018 MAP final was a tense clash for the two combatants, Graham Ball (6) and Chris Henderson (2), with some excellent scoring. Despite losing the first two holes to par and birdie, Graham rallied to take the lead by two on the seventh hole. Not to be outdone, Chris took the eighth and the pair moved to the back nine with Graham 1 up. Still on the warpath, Chris eagled the par five 11th and won the 12th to regain the lead. Another fightback by Graham meant the pair approached the 18th hole with Graham 1 up but Chris took the hole, meaning extra holes were required. On the 19th, Graham slotted his 20-foot birdie putt to take the match and to win the title for the third time. Oakdale Seniors lost the last of their Interclub fixtures away to Bedale 5-3. Men’s Annual Medal, Division One: 1 Keith Burns (10) 70; 2 Carl Westerman (8) 72; 3 Peter Johnys (11) 75. Division Two: 1st Alan Key (14) 71; 2nd Anthony Glazier (13) 71; 3rd Graeme Fenwick (14) 74. Division Three: 1st Ed Warburton (19) 71; 2nd Doug Taylor (19) 71; 3rd Eric Winterburn (20) 77. Rabbits President’s Day: 1st Anthony Smith (26) 34 pts; 2nd Mike Barker (19) 34; 3rd Graham Scott (22) 34. Silver Division: 1st Lynn Wood (19) 32 pts; 2nd Patsy Rochester (8) 29; 3rd Kathryn Hughes (14) 24 . Bronze Division: 1st Mandy Fallon (27) 37 pts; 2nd Barbara Ritchie (26) 31; 3rd Sue Whittington (24) 23. 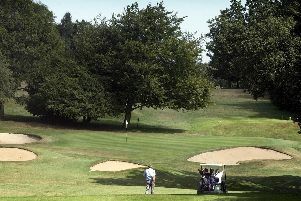 Seniors Nine-Hole Stableford: 1st John Dobinson 21 pts; 2nd John Abbott 16; 3rd Barry Holland 15. The Ladies who had won Stableford competitions throughout the year competed for the two Annual Stableford trophies. The Ladies of Division Two played for the Peter Backhouse Trophy and this year’s clear winner was Elizabeth Walkinshaw with an excellent score of 36 points. For the Jessie Leadbetter Trophy the Division One Ladies had a very close fought contest with Ann Lawson on 28 points just edging past Judy Holroyde by one point. The rest of the Ladies played in a qualifying, nine-hole competition. Jenny Hill on 17 points, won a close encounter on a countback from Ann Jowell and Lynda Johnson. On Saturday, it seemed appropriate, on Ryder Cup weekend that the Men played a matchplay competition. A par-bogey format meant that each player was playing matchplay against the course. A nett par was a half, a nett birdie or better was a win whereas a nett bogie or worse was a loss. The conversation in the “19th” suggested this was a tough competition with concentration being the key to recording a positive score. Simon Chadwick won Division One with a positive score of three holes. David Underwood had to settle for second spot after a back-nine countback. Jonathan Goodall came third with a score two. Division Two was a tight affair with Shaun Johnson prevailing over Peter Raybaud on a countback, both recording a positive score of two. Peter Watson headed a group of four players only by a countback to take third spot with a score of one. Separating the first and second in Division Three also relied on a countback, Chris Schofield taking top spot from Rex Bradshaw, both had a score of 0. Kieron McGeever camethird with a score of -1. On Saturday we held the Autumn Trophy, 116 players attending the stableford qualifying event. Ethan Stott won division One with three birdies and 13 pars beating Archie Hughes by four points. Wilfredo Lorenzo won Division Two with a birdie and eight pars beating Janet Cooper by a point. Richard Gill won Division Three with seven pars beating Steve Joyner by five points. Results, Division One: 1st Ethan Stott 41 pts; 2nd Archie Hughes 37; 3rd Charlie Littlewood 37 . Division Two: 1st Wilfredo Lorenzo 38; 2nd Janet Cooper 37; 3rd Tim Gillatt 37. Division Three: 1st Richard Gill 40; 2nd Steve Joyner 35; 3rd Richard Noland 35. Twos club went to Archie Hughes who had two twos, Dan Wilcox, Brian Mclellend, John Lyon, Stuart Ingham, Janet Cooper and Tony Williams. Adam Temple won the midweek stableford on September 26 with a birdie and 11 pars, beating Robert Goddard by two points. Result: 1st Adam Temple 41pts; 2nd Robert Goddard 39; 3rd George Stevens 36. Twos Club: Marc Rice, David Birch Stewart Carr and Adam Temple. The Rudding Park members AGM will be on Monday November 19 at 7pm in the clubhouse. All members are welcome to the AGM and a complimentary drink will be provided by Rudding Park. The Champion of Champions Trophy will be played this Saturday. Tee times have been drawn and play will commence from 8am. Please see the notice board and check your times. A fantastic day on and off the course for the Rudding Park Ryder Cup on Sunday as 40 players represented England and the Rest of the World. Great golf came in all styles, however, only one man could claim an ace and it was Stuart Ingham who bagged the 14th. The overall team prize was won by the ROTW team who beat England 6.5-5.5. You may have noticed copies of a book of the new rules for 2019 in the clubhouse. Please pick up a copy and familiarise yourself with what is happening. There are some important changes, some of which weren’t in the proposed new rules which were first published in 2017. The book is a shortened version of the rules and is printed in an easy to follow style. Registration for the season closer on Saturday October 27 is from 7.30am. Shotgun start for all teams and players at 8.30am prompt. Format is Texas Scramble, prizes for the top four places plus many on course prizes. Nearest the Pin, nearest the line, Longest Drive. Tea/coffee and bacon rolls will be served from 7.30am followed post golf by a winter Sharing platter. Entry is £17. At the start of what feels like an Indian Summer last Monday 38 Seniors played their last roll up to count towards the Summer merit table. The results of the competition were: 1st Anthony Pearson 38 pts; 2nd George Gibson 36 (after countback) 3rd Peter Goldie 36. Congratulations to Keith Richardson who was top of the summer merit table with five scoring rounds, including two wins. Sandy McDonald was the winner of the Winter merit table, but the overall winner of the annual award, the Phil Lewis Trophy, is John Jackson and congratulations to him for consistent golf over the year. The fine weather continued on Thursday for 12 teams of Seniors to compete in a Yellow Ball competition whereby the Yellow Ball player and one other player were to count. Against a par score of 74 points there were some excellent scores with the following results; 1st Jeff Jones, Gordon Knights, Frank Ashford, Frank Bailey 84 points; 2nd Ralph Oxby, David Herrington, George Bellis, Colin Wilson 83; 3rd Archie Hughes, Bob Fawbert, Graham Metcalfe, Alan Bradley 77. 1st Janice Walker (23) 33 pts; 2nd Sharon McDermid (27) 31; 3rd Sheila Philips (14) 29. Division One: 1st Sally Hunt (15) nett 69 ; 2nd Terri Williamson (13) nett 72 (countback required) ; 3rd Linda Mableson (20) nett 72 (countback required). Division Two: 1st Sheila Grant (24) nett 73 ; 2nd Yvonne French (29) nett 76. Division Three: 1st Ginny Kirk (44) nett 82. 1st John Condon (8) 38 pts; 2nd David Hennessey (15) 36 pts (countback required); 3rd Brian Lawrence (17) 36 pts (countback required); 4th Denis Thompson (10) 35 pts. 1st John Clark (22) 43 pts; 2nd Sandy Taylor (13) 38 (countback required); 3rd Neil Exelby (30) 38 (countback required); 4th Kevin Clinton (17) 36. A fine autumnal day, with just a hint of breeze, and a golf course in fine condition greeted the 29 players last week - unfortunately, the majority failed to capitalise and some low scores were carded. However, once again, Jim Hargan put in a brilliant round to win with 38 pts. Mike Ingram (36 pts) was runner-up with Phil Simons (35 pts) in third place after a countback. Steve swift (20 pts) won the best front nine with Peter Durrans (18 pts) taking the back nine after a countback involving five others. The team prize went to Dave Fleming, Chris Mead and Jim Hargan (84 pts) with Keith Davison, Tony Jameson-Allen and Harry Sargent (79 pts) in second place. A weekend of twin triumphs for Josh Reid (5) as he captured the junior matchplay title then, the following day, topped a junior stableford contest. It was the third successive year that Reid and Josh Roberts had met in the matchplay final, and it found Reid in stunning form, winning the match five and four. Reid was one up immediately when he holed from 30 feet at the first then holed from 35 feet to move two up after two. He was five up after five before Roberts (10) forced a half at the next three holes. But a Reid win at nine saw him turn six up before Roberts finally won a hole with a four nett three at 10 then just missed a putt to win at the 11th. But he did win at the 12th with a fine par reducing the deficit to four. Reid had to sink a 15-footer after racing past the flag at 13 while Roberts missed his birdie and the chance to cut the deficit further. Sadly, he overhit his shot to the green at the 14th and was unable to find his ball in the rough, conceding victory to Reid. The winner then went on next day to take first spot in the Juniors Stableford with 35 points. Darren Swales (5) added 10 points to consolidate his Order of Merit lead when he finished fourth in Saturday’s Pro Stableford after shooting level par, with birdies at 11 and 16, to make 36 points. He heads the Order of Merit with 85 points with Tommy Grant (14) second on 49 points. But it was veteran Harry Sadler (27) who topped the field on Saturday with 39 points. Yet the most celebrated moment was the hole in one from Martin Unwin (8) at the fifth in a round of 36 points. Pam Hunter (34) returned to golf last year after several years sailing the British coastline. She sailed back into it with a sub-par round of 38 points to win the Sinclair trophy, sinking a series of putts which showed little effect from two days of sand-banding. Sue Williams (31) with 32 and Brenda Moore (10) with 30 were second and third. Always a popular fixture, the Grandma’s Trophy went this year to Ann Balsdon (28) who posted 35 points on the sandy surface, five better than Pauline Kirk (37) and six better than Liz McVey (17). The Coolidge Cup is played as a waltz with a mixed four-member team, and a terrific score of 84 points earned the l prize for Malcolm Lawrence, Richard Capes, Maureen Thorndyke and Angela Newman. Results: Midweek qualifier: Robert Pickthall(14), 67; Stan Duddles (15), 71; Maurice Whorley (15), 72. Sunday qualifier: Andy Harrison (20), 72; Tony Blackmore (17), 75; Gavin Hall (6), 78. On September 29, Ripon’s gentlemen competed in the October Medal competition in pleasant conditions, though there was an end of summer feel in the cool air, especially for the early starters. Each division was closely contested, though congratulations go to Nigel Pickard who after 35 years of trying, scored his first ever hole-in-one with his first shot of the day. On Tuesday September 25, Ripon’s ladies played in a stableford competition which was won by Pat Bean with 37 points. In second place was A King on 34, and third went to D Dennison on 33.